Much earlier in the year I took part in a 48 hour game making event over at Glorious Trainwrecks. The aim was to make as many videogames as possible, the result being 529 games created by 102 people. That’s sort of amazing. Every month Glorious Trainwrecks hosts a ‘Klik of the Month Klub‘, where, in the space of 2 hours, participants try make a game. Generally people use very simple tools—most commonly Klik and Play—and work from simple ideas. It’s very accessible to people, like myself, who have no idea, or want, to learn how to program. The results are often messy, goofy, and not always so good; but it’s a lot of fun! This was an experiment in making a horizontal shooting game; particularly the part that seemed the most daunting to me: designing the enemy patterns. I think it turned out quite nicely. The player’s avatar is based on a shiv I found in a bin in a hostel. The title is a riff on a Dirty Three song. A game for two people, based on a game I used to be quite good at: British Bulldogs. Players alternate between trying to get from one side to the other, and trying to stop the other doing so. It’s a bit too fast, so relies on chance too much. I hadn’t played it with another person till recently. It’s an idea I had a long time ago, but never had the drive to put the whole thing together. That’s one of the interesting things about these events; you have so little time you just have to cobble the thing together, somehow. Inspired by the videogame series Castlevania, somewhat loosely. It’s the game most like a real videogame: players must complete screens of enemies, and boss enemies. 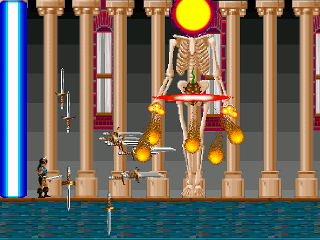 The trick to the game is that you can ‘shoot’ a hell of a lot of swords at once. This is an accidental feature, because I couldn’t figure out how to make a character swing a sword, so I made them shoot, then I accidentally made them not disappear. Being an artist is about knowing which mistakes to keep, and which to discard; right? It’s the most popular game of mine on the website. This one’s a joke/comment on videogames that are more about collecting baubles than being enjoyable in and of themselves. People don’t seem to like the end, but I do. And I think think the title screen is quite clever! Colour2 is my favourite. It makes images by generating shapes in a somewhat randomised manner. I wanted to recreate another, similar, thing I made many years ago. It would ‘shoot’ coloured squares in the direction of the mouse cursor. That was made in The Games Factory (a later program by the makers of Klik & Play), which allowed the shot squares to mark the screen with their colour. So the player could draw, in a way. Klick & Play doesn’t allow for this, so the game changed a bit. It also has sometimes-troublesome mouse support, that I wanted to avoid. You can use the number keys to change levels. Number three’s my favourite. You can download the compilation from here. I may append some recommendations when/if I play through them all.